CCW is collecting gently worn shoes again in 2011. Ten pairs to start! April 2011. Over 150 pairs of shoes were collected in 2009 for Soles4Souls, Inc. who distributes the shoes to people in need such as victims of natural disaster or living in extreme poverty. More than 4 millions pairs of shoes have been distributed to people in over 70 countries, including Honduras, Uganda, Romania, and the US. 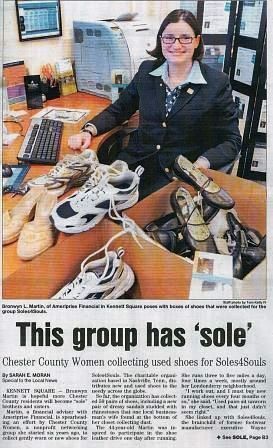 CCW partnered with the Kennett Square Rotary Club in collecting over 100 pairs of shoes and received local press about the 2008 end of year shoe drive. Bronwyn Martin met the Soles 4 Souls CEO in Atlanta in 2011. The first 50 pairs of shoes were shipped Feb 3 2009. CCW is again a supporting organization of the PA Conference for Women. This year the event takes place in Philadelphia Oct 25 2011. For more information please visit that website. Location: PA Convention Center in Center City. CCW has formed the Revolutionary Runners, an informal running/walking team to participate in local events. Kennett Square Rotary Club, Kennett Area Senior Center, Kennett Symphony, Faunbrook Bed & Breakfast, WCU Women in Leadership and Service, and Ameriprise Financial, Inc.
CCW has been active in breast cancer and ovarian cancer awareness. The first anniversary in 2004 raised over $2,000 for breast cancer awareness for Living Beyond Breast Cancer, a local grass roots organization. 2004-2010, CCW has had a team walking in the Philadelphia’s Susan G Komen Race for the Cure ®. In 2008, $6,300 was raised for the Race for the Cure ®. In 2005 CCW began it’s support of the Sandy Rollman Ovarian Cancer Foundation (SROCF). Through CCW’s efforts, mainly through CCW anniversary celebrations, over $22,000 has been raised for ovarian cancer awareness 2005-2009. Also in 2005, CCW started supporting a woman each year through Women for Women International. $324 is spent each year to support a woman in a war-torn country to give her the tools and resources to move from crisis and poverty to stability and self-sufficiency. Germaine Zigabe in DR Congo, Rosa Amisi in DR Congo, Vinciane M’njungu in DR Congo and Beatrice Mukamzimpaka in Rwanda are the 4 women supported 2005-2009. The support to Beatrice allowed her to repair her house ‘which was almost falling on me. We thank you for this.’ Beatrice’s husband left her with their 6 children. Beatrice extends an invitation to visit her. December 2009 started the relationship with our 5th ‘sister’, Titi Maryamu Manja, a widow with 7 children. In Dec. 2010 a new 'sister' has been assigned, Kezia ABenego Chali, in Nigeria. Meeting fees from have been given to various organizations. Over $500 was given to the PA Home of the Sparrow; over $100 was given to Camp DreamCatcher; over $300 was donated to the Girls, Inc in Philadelphia. “With the pooling of one’s financial resources, more can be given away.” Several have commented that the community aspect is a big reason of why they support CCW.